Dry brined pork roast. Do it. It’s an easy way to ensure moist, flavourful meat. Spit roasting (preferably over charcoal) gives depth of flavour. Put them together for a killer pork roast. 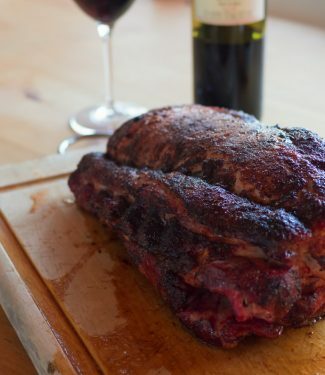 For this recipe I used a whole pork sirloin but it would be even better with a boneless pork shoulder. A little extra fat adds a lot of flavour. Serve it up with a bean recipe of your choice – pintos are nice – and a nice green salad and you have a dinner that screams summer time. Dry brining, pioneered by Judy Rogers of Zuni Cafe fame is an easy way to add flavour and moisture without the drawback of odd texture promoted by wet brining. Simply sprinkle the meat with 1 Tbsp of kosher salt per 5 pounds of meat. Place meat in a large ziplock back (or just a couple grocery store bags if it doesn’t fit) and refrigerate turning ever 12-24 hours for up to 4 days. I’m told salt will penetrate at a rate of about 1 inch per day. Look at how far the salt has to go at an inch per day and that’s how long you need to plan ahead when you make this dry brined pork roast. This technique is absolutely fantastic for your holiday turkey. Try it. You will be the Thanksgiving superstar. This is all about indirect heat. If you are using a gas grill you do not want direct heat coming up from below the pork. Some have a burner along the back of the grill. This is what you want to use. You will need to find a way to add some smoke flavour (otherwise you might as well use your oven) – chips in tinfoil is a good option. Place a drip pan under the meat or you’ll have one wicked grease fire next time you fire up the grill. 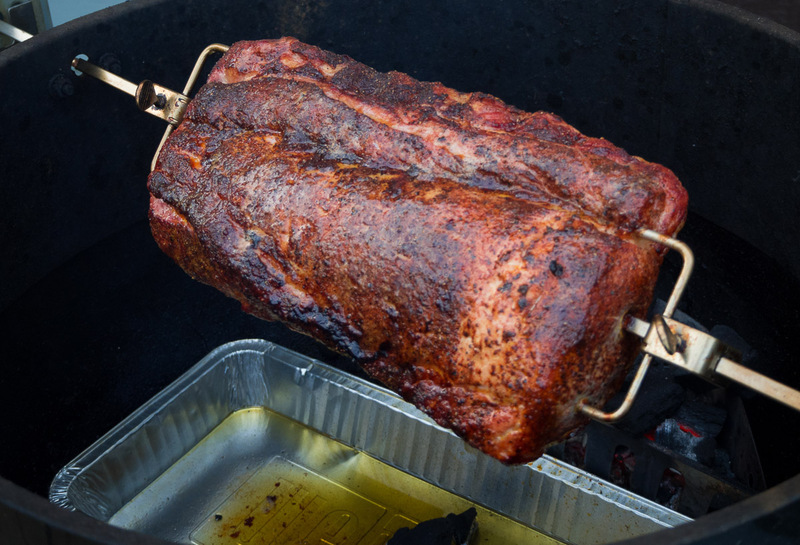 If you are using a charcoal grill like a weber kettle set up your fire on either side of the kettle with the rotisserie running down the middle with a drip pan under the meat. If you have a weber kettle and you don’t have the rotisserie ring you are missing out on something wonderful. I’ve had mine for probably over 20 years. Lasts forever. 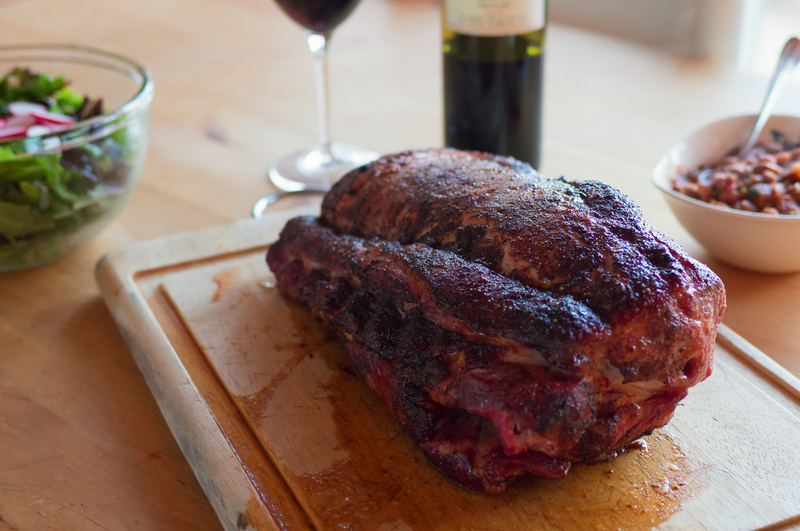 Dry brined roast pork cooked on the BBQ is an easy way to feed a bunch of people. The dry brine ensures the meat is moist and well seasoned and who can resist anything done on the grill. Dry brine the pork loin for 3 to 4 days using 1 Tbsp of kosher salt per 5 pounds of meat. Combine the dry rub ingredients. When ready to cook, remove from refrigerator and rub liberally with the dry rub. Thread the rotisserie spit through the meat lengthwise. Spit roast until the internal temperature of the pork loin reaches 135F Remove from your BBQ and let rest 15-20 minutes. Simply mix the board drippings with a bit of olive oil, salt and pepper. Depending on what you are roasting you can also add a bit of fresh lemon juice or some finely chopped herbs. Really, it's up to your imagination. If you don't like my dry rub use yours. Just make sure you don't use more salt. It will be well seasoned from the dry brine. If you didn't have time to dry brine use whatever you want. You are in control here! Cook the pork to an internal temperature of 135F. The temperature will rise another 5 degrees or so while the roast rests. This follows health guidelines. The days of cooking pork to 160F are gone. Google it! In bbq and grilling, main course, meat, pork. Bookmark the permalink. I never knew you could dry brine, this is a very interesting technique I must try! I usually do a wet brine and you’re right it get’s messy! Especially when I do bigger roasts but I love the result that salt produces! I have never had dry pork since then! I’m actually surprised more people don’t teach this method more often, the amounts of dry pork I had in my life (even at restaurants) :\ kinda gross. Thanks for this fantastic post! I love learning new things from you! Hi Joyce. I hate dry pork too! You can dry brine anything you would wet brine. This works great with turkey.